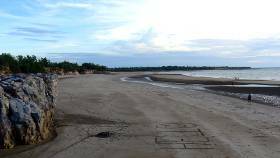 Except for the very high spring tides, the beach is a wide expanse of white sand, a great place to walk the dog, go for a run or just enjoy the evening breeze and setting sun. It's easy to find, simply drive along to the end of Trower Rd. A section is set aside as a free beach and current trials allow Blo-Karting along the sand if you have a permit and stay in the designated area. Check the beach signs for details. Remember that box jellyfish are present in these seas almost all year round, however June, July and August are considered safe for swimming. The occasional crocodile is spotted here too, so be vigilant. Crocodile traps are set to remove them from the area, but there is always the chance one will be passing by. At high tide the water washes half way up these sandstone cliffs (left). 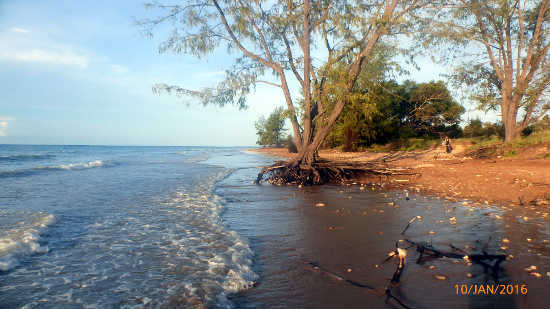 8 metre tides ensure the beach is never quite the same each time you visit. Old fence lines in the sand and trees that seem to walk into the sea show that the beach is changing. Maybe it's just a normal change, but it looks as if rising sea levels are making their mark here. 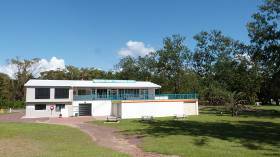 The Darwin Surf Lifesaving Club is located just behind the beach, next to a picnic area with lots of green grass and shady trees. 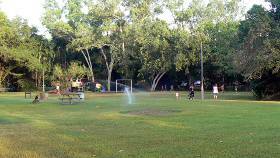 The picnic area has BBQ plates and play equipment for the kids, drinking fountains and showers to wash off the sand from the beach. 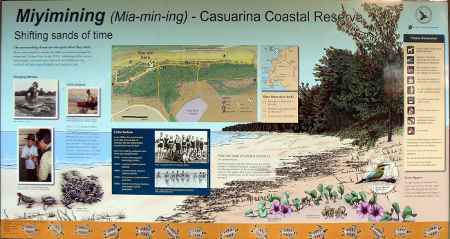 A bike track follows the coast from Nightcliff, over Rapid Creek and past the university to the cliff tops at Casuarina overlooking the beach. There are also tracks with raised boardwalks through the mangroves behind the beach, allowing access from Rocklands Drive or the Hospital. 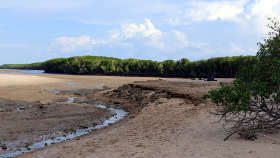 Buffalo Creek marks the end of the Casuarina Beach reserve, about 1.7 kilometres further on from Lee Point. It is accessible directly by road if you turn off the Lee Point road immediately after the caravan park. 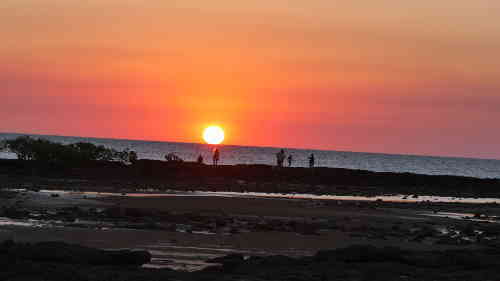 Return from Casuarina Beach to Enjoy Darwin Home.